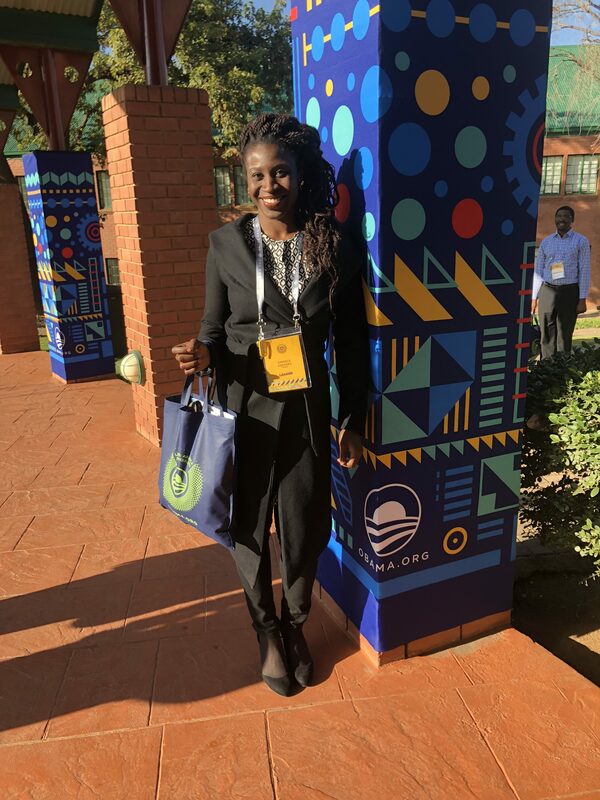 Earlier today, Simidele Adeagbo shared a reflection on her experience at the Obama Foundation Leaders: Africa program in Johannesburg, South Africa, on Tuesday, July 17. If you’d like to receive updates like these, you can sign up for our email list here. Earlier this year, I had the privilege of becoming the first Nigerian to compete in the Winter Olympics. It was a humbling experience, one that taught me about the importance of setting a good example, the value of teamwork, and the power that one person’s story has to inspire others. 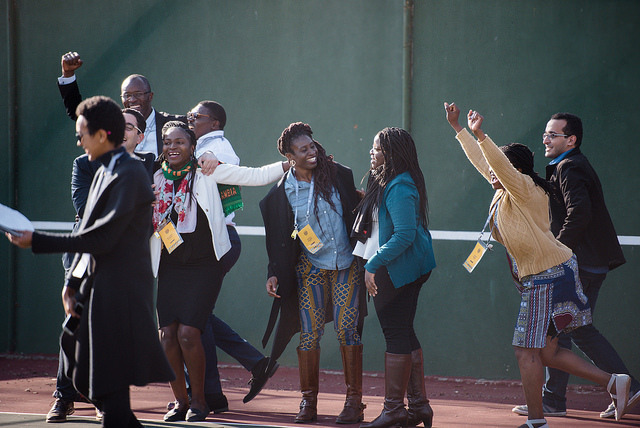 During Wednesday’s session of the Leaders: Africa convening, I felt privileged once again, as each of those lessons was reinforced in an entirely new way. The day kicked off with words of wisdom from former Secretary General of the United Nations Kofi Annan, former Minister of Foreign Affairs of Algeria Lakhdar Brahimi, and the first female head of state in Africa, Ellen Johnson Sirleaf. These three phenomenal leaders epitomize African leadership, and it was an honor to have them share their thoughts with us Leaders as we seek to shape the future of the continent. They talked primarily about ethical leadership—about standing firm in doing what you believe is right for the greater good—and also about having the determination and perseverance to achieve your goals, and the vital need for African countries to collaborate to succeed. In their time of service, these legends broke barriers, set an extremely high bar for excellence, and left behind significant legacies. They’ve now passed the baton to my generation—to the leaders assembled in the crowd—and we have the responsibility to build on the great work they’ve done. What an opportunity! After the epic panel with the legends, we divided into 40 groups of five Leaders each, and the rest of the day was dedicated to crafting a solution to a tough social challenge and preparing our IdeasFest pitch. My team was focused on combating youth unemployment, a major challenge across Africa. In working toward a solution for this problem, my group had to find the commonalities across the five different countries each of us represented—Nigeria, Mali, Senegal, Ethiopia, and Egypt. My team ultimately crafted an enthusiastic pitch for a three-month, technology-based entrepreneurship training program—an idea that our fellow Leaders said best embodied the Obama Foundation’s values. This was a real life example of the lesson we just took from the morning’s panel on the vital need for Africans to collaborate in order to move the continent forward—and a moment of great pride and joy for what we accomplished as a team. Finally, after a tasty South African street food dinner, we gathered in the auditorium for a conversation with the writer and director of Black Panther, Ryan Coogler. Ryan shared his inspiring personal journey of growing up in Oakland, California, to now becoming one of the most important filmmakers of our time. Ryan also shared observations from his first trip to Africa when he was conducting background research for his film. It was interesting to hear his perspective on the way Africa has traditionally been portrayed in the western world and his approach to telling the truth that he sees in Africa. He explained that one of the key themes Black Panther explored was the tension between tradition and innovation—a tension I believe we face in modern-day Africa as well. Ryan also spoke about the strong African female characters portrayed in Black Panther. He said, “Women are a resource to society and they shouldn’t be limited in any way.” It’s refreshing to see art imitating life as we know the future is female and African! I know the lessons I’m learning from the Leaders: Africa initiative will help shape my work as I strive to unlock the power and potential of Africa’s youth. According to Ryan, “The biggest crime for an artist is not to be present.” I believe the same to be true for a Leader. I’m present—and I’m taking in every bit of the Leaders: Africa initiative with all my senses and no distractions. We are the ones we’ve been waiting for.